For all the hideous qualities of black metal, inside even the most deprived and heinous can be streams of beauty. Sorry if that hurts your feelings. Name just about any black metal band—Emperor, FALSE, Krallice, whoever—and you’re going to find parts of their music that takes a step back from the brutality and lets you immerse yourself in imagination and delicacy. It’s that duality that makes it work. Norwegian artist Sylvaine is a perfect example of this. Her music tends to lean more on the atmospheric side than most, but when she pulls back and opens up the furnace, your flesh will feel scorched and painful. Her music has been a favorite of mine the past few years, and the work she does reminds me a bit of Myrkur, making it feel like something that operates on the periphery of consciousness. “Atoms Aligned, Coming Undone” is her third record and second for Season of Mist, and it shows even more progression for this great artist (she plays everything, save for the drumming) and one of the more visceral records of the entire year. There is plenty of drama and a foggy, yet electric ambiance that goes back and forth between utter savagery and musical beauty, capturing your imagination and keeping it until the final moments tick away. “Atoms Aligned, Coming Undone” is dark and plodding at the start, with Sylvaine’s singing floating over top the scene before the track rips open. Her singing soars as the track becomes slow driving and calculated, with the bass slithering, plotting the course. The track boils, while the vocals tear apart serenity, with the music gushing, the song hitting crescendo, and everything fading. “Mørklagt” has guitars charging hard, as the singing swims through the murk, and the riffs take on an ashy feel as things work their way into the fog. The track then erupts, with black metal terror striking, as the storm builds and pushes forward, and maniacal screams haunt dreams, with the track ending in a stream of atmosphere. “Abeyance” has guitars trickling, with Sylvaine’s singing reminding a bit of Bjork. Her vocals are strong, as usual, with guitars breaking apart the ground, guitars lathering into a fury, and a gazey fog coming behind it before things burn away dangerously. “Worlds Collide” is clean at the start, with the music trickling gently, and softer singing emerging. It’s a dark ballad, this one, as more serene tones take over, letting delicacy and vulnerability reign before disappearing into the clearing. “Severance” has guitars ringing out and stinging your senses, with punchy melodies establishing the tone, and the singing just swelling. Just then, the track explodes, as Sylvaine’s shrieks start doing damage, shredding muscle and bone, and as a deluge of sound floods the scene, her singing bellows and shakes the ground, as the track soars off into space. Closer “L’Appel du Vide” begins clean, with a frost rising and coating all plant life, and softer vocals emerging like clouds of steam. The music drizzles and delicately crawls over the ground on its knees, before the guitars rush in and well up, and a burst of emotion explodes. The intensity rises and falls, as the music turns into a trickle, and the ghost of this one becomes one with the mist. 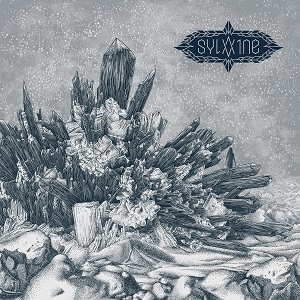 Sylvaine is a unique, gifted artist, one who has put a different aura on black metal and hasn’t shied from pushing what this kind of music means. “Atoms Aligned, Coming Undone” is another huge step ahead for Sylvaine, and it’s the most impressive album of her entire run. If you have a chance to get your hands on this record—and what’s stopping you?—plan to pull yourself away from everything, darken the lights, and immerse yourself in every raindrop and blood streak of this adventure.